Have you seen The Force Awakens yet?! Unquestionably one of the most iconic characters from the newest movie in the Star Wars franchise is a spherical astromech droid named BB-8. He’s totally adorable, and I decided to turn his likeness into a winter hat, or toque. (The shape is perfect, right?) Three drafts and a whole day of crocheting later, I had something that fit well and looked fabulous. So here it is, my free Star Wars BB-8 inspired pattern! The pattern is pretty simple, but one round does require you to make color changes mid-row while carrying the yarn along. I included several photos and links to video tutorials if needed to explain and demonstrate this process very thoroughly. You should also know how to do front post half double crochet and back post half double crochet stitches, which create the ribbed brim. 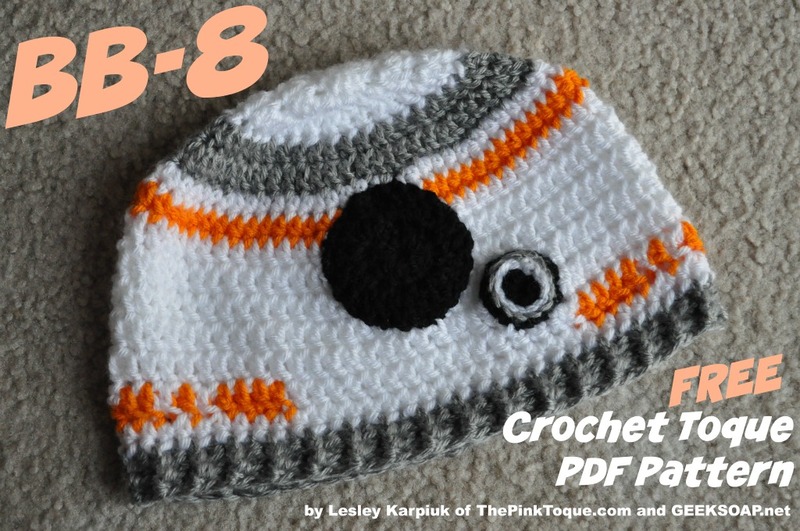 Head on over to Ravelry to snag my FREE BB-8 Crochet Toque Pattern. Please note that the pattern is provided free for personal use and should not be copied or redistributed. Have fun making hats! May the Force be with you and may this toque keep you warm while you’re standing in line waiting to get in to The Force Awakens! Let me know if you have any questions. Enjoy! I have a question on the pattern, for some reason my count is off in rounds 4 and 5. Am I reading the pattern right? For example in rounds 4: Ch3 then 1DC, then 2DC around. Is that what you mean by *DC Inc, 2DC around? I apologize if this is a stupid question I am new to reading patterns….thank you in advance!